Comfort in a bowl – that’s the reason I make this one-bowl stir fry. My boys enjoy it every time, no matter how frequently they have to eat it and I use whatever seafood I have, calamari, any firm white fish or a combination of seafood. I think if you don’t care too much for seafood, boneless chunks of chicken thigh or cooked duck or just about anything would work in this recipe. Vegetarians could use nice, meaty mushrooms instead. So no rules, just some ingredients and a very doable recipe. The only deal with a stir fry is that you must have all the prep done before you begin cooking. Clean the mussels and remove their beards and any grit. De-vein and wash the shrimp and ready the aromatics and vegetables (garlic, ginger, carrots, green capsicums). Have your sauces and oils out on the counter before you begin cooking. Once you’re ready, believe me, the cooking and the eating is done with before you can spell noodles. And you’ll never, ever have any leftovers. Let me know if you do! Soak noodles in a pot of boiling water covered for 7-10 minutes, after turning off the heat (they must be cooked but al dente). Drain. In a bowl mix together soy sauce, sugar, five-spice powder and cornflour to form a smooth paste. Add a teaspoon or two of water if the mixture is too thick or lumpy. Heat the sesame oil in a wok or large pan and quickly fry the ginger and garlic taking care to not burn them. 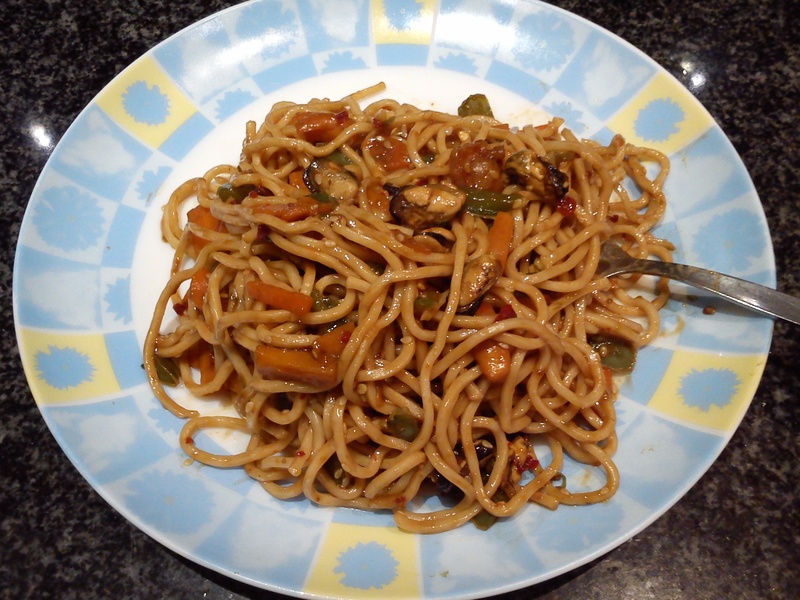 Toss in the vegetables and stir fry on high heat till lightly caramelised and cooked but still crunchy (about 3-4 minutes). Now add the shrimp, mussels and tomato purée and cook (stirring all the while) till the seafood is done (about 7 minutes). Time to put in the noodles and the soy sauce mixture. Make sure the sauce coats everything as it thickens. Sprinkle sesame seeds on top and serve immediately.